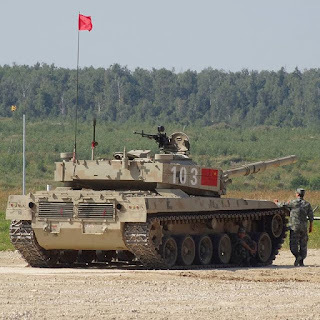 BEIJING, -- China's People's Liberation Army (PLA) is likely to use the Type 96B main battle tank (MBT) as the pillar of its tank fleet, replacing most of its older models, the China Daily newspaper quoted military analysts as saying on 10 August. Gao Zhuo, a Shanghai-based military observer who is in close contact with the PLA, told the paper that the "excellent capabilities of the Type 96B qualify it to be the backbone of China's tank force". "The Type 96B is the strongest variant of the Type 96 family and is truly an advanced, third-generation MBT," said Gao, adding that the PLA will use it to replace obsolescent tank models such as the Type 59 and Type 69. China North Industries Corporation (Norinco), one of the country's biggest military manufacturers, developed the Type 96B - a new variant of its Type 96 (ZTZ-96) MBT - in time to participate in this year's Masters of Automobile and Tank Hardware competition, also known as the Tank Biathlon, at the Alabino training range in Moscow. The PLA sent several Type 96B MBTs to take part in the tank competition, which is regarded as the most watched event in the Russia-hosted International Army Games. By the end of last year the Chinese military had more than 7,000 tanks in active service, including about 2,000 Type 96s and Type 96As as well as about 600 Type 99s and Type 99As, meaning that the majority of the PLA's armoured force is still equipped with tanks built several decades ago, China Daily quoted analysts as saying. Huang Guozhi, senior editor at Modern Weaponry magazine, told the newspaper that despite the fact that the Type 99 MBTs are more advanced, their high price and limited production capacity make them "unrealistic for the PLA to purchase and deploy them on a large scale". The China's People's Liberation Army is likely to use the Type 96B MBT as the pillar of its tank fleet, according to a media report.